Ever since the debut of The Pirates of the Caribbean, ‘pirate fever’ has hit many households. One of the most frequently requested items is a cardboard pirate ship. There are many great cardboard pirate ship designs. Some are big, some are fancy, some are easy to make. There are so many designs out there that it can be confusing. Which one should you pick? How many children (and adults) will be playing with/in it. Your child’s age. The younger your child, the more likely he or she just needs a simple one. Whether you want to involve your child in making it and if so, what is his or her level of ability. Are you intending to use the pirate ship as a photo op for a special event such as a birthday party? The space that you have. How much time you have to make it. Whether you have the materials necessary to create it. How much you want to spend on materials if you don’t have them. Whether you want to invest a little more cost, time and effort into creating a long-lasting, awesome pirate ship or you just want something simple that you know your little tornado will destroy in a day. Safety considerations. For example, no sharp hard edges or loose nails. Cardboard paper or a cardboard box. Wood pieces, twigs or matchsticks. Materials that add weight to the ship. Color pencils, crayons, paint or marker pens. There is a common similar process that you follow to make a cardboard pirate ship. It starts with measuring and cutting out the shape of the pirate ship on your cardboard. You then use masking tape or glue to connect the pieces together. You may decide to add windows by cutting out holes in the side of the cardboard or adding a mast by using a stick poked into a hole in the cardboard. When you decide what other fancy add-ons you want to have for your pirate ship, the steps you then have to take will vary depending on what the add-ons are. You may wish to paint it. You may want to replace the sails with fabric. You may want to create cannons or an anchor. Keep reading for ideas. Which cardboard pirate ship should you choose? If you have the resources and the space, why not make a pirate ship that is big enough for your kid(s) to actually physically play in? You will need very big cardboard pieces (maybe get some fridge packing cardboard boxes?) and of course a large area that is dry to put it in. Your cardboard pirate ship could have long pieces of wood that could act as masts and colored pieces of cardboard or cloth to form sails. The Greene Acres Hobby Farm is combined with a play structure which is a fantastic idea! You automatically make the pirate ship “fun” and it will be less work if you don’t have to craft all parts of the ship. You can also transform an existing play wagon into a pirate ship with some extra cardboard. Best of all, your pirate ship can move! Mr McGroovy’s Pirate Ship is a decent-sized ship that can fit at least 3 children with a plank! To make the pirate ship seem more realistic, you can paint the ship. This will add a lot more work and time to your project but if you wanting to use the ship as a photo op, you may want to do this. The beauty of a small pirate ship is that you don’t have to worry about storage. You also need less materials and you don’t have to worry about your kid(s) getting into all sorts of trouble in it. Mollymoo’s cardboard pirate ship looks great and it is a great size for your child to place their toys in. It does require some attention to detail and some materials such as twigs and fabric but these are probably easy enough to obtain. Red Ted Art’s cardboard pirate ship is a little more tricky using paper mache paste and it needs painting. But the finished product looks pretty cute. This cardboard pirate ship from flickr.com is pretty straightforward and you can build it right in your living room. Amanda Medlin’s cardboard pirate ship is also pretty simple if you ignore the sail made from PVC pipe. Replacing the PVC pipe with a broomstick will probably be easier. 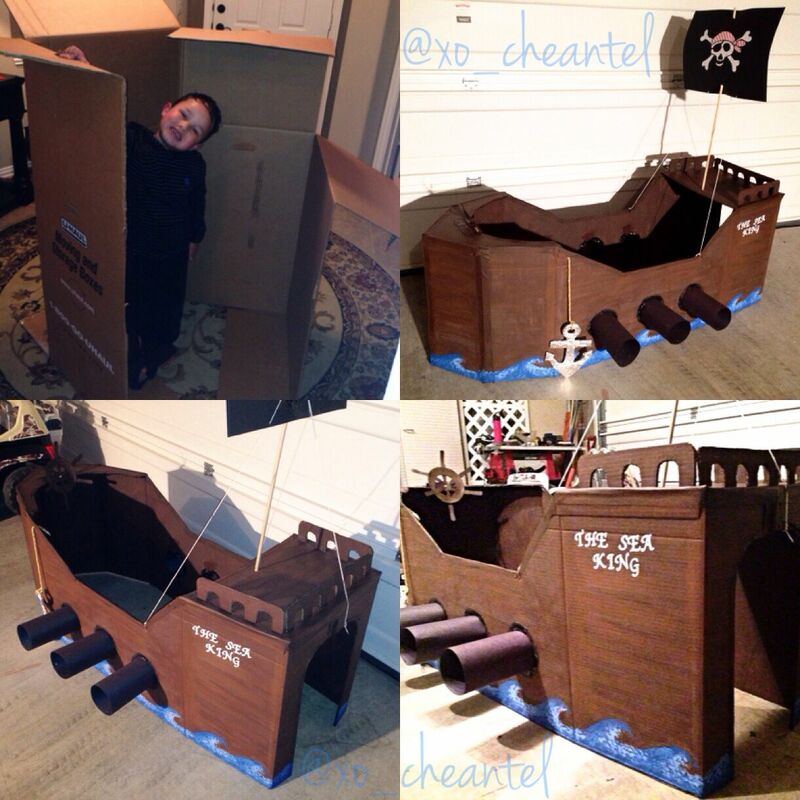 If you are really crafty and are one of those parents that creates ‘parent-envy’ among other parents, you may want to try these more challenging cardboard pirate ship designs. This one from pinterest has really nice looking cannons. 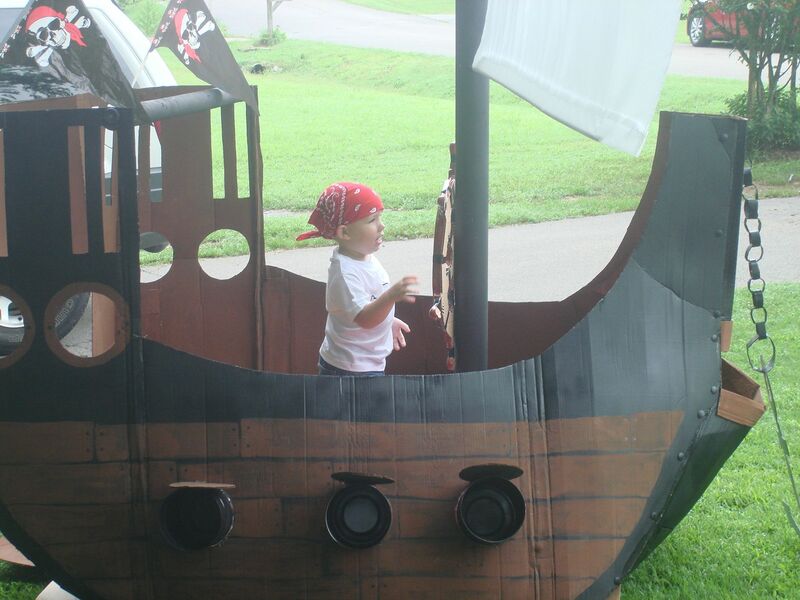 This pirate-themed birthday party cardboard pirate ship is so ‘arty’, we love it. You can use chalk on it to write special messages or the names of guests to your party. 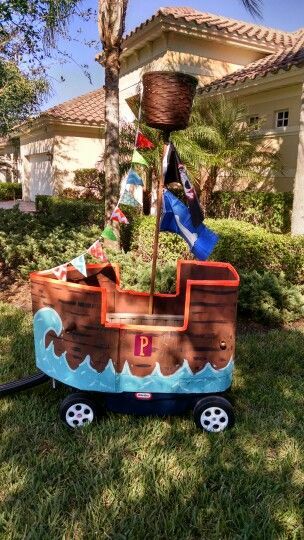 This other birthday themed pirate ship will be intimidating to a non-committed parent but it looks terrific. In the end, you may want to use a combination of these ideas. The important thing is that you don’t stress yourself trying to make it. Keep it fun and your kid(s) will love it anyway!